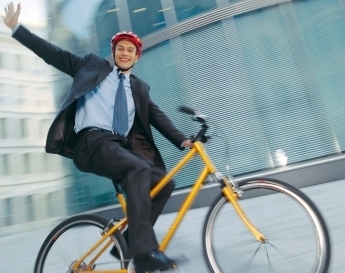 Riding to Work is the latest craze as people begin realising the multitude of benifits which surpass the costs, inconvenience and frustruation of driving and public transport when getting to work. Exercise is the key to well being, and arriving at work in the morning with your daily dose done will make you feel like a million dollars. Exercise gets the endorphins flowing and cycling is a great form providing stress release. No longer will you be stuck in traffic, jammed into a train, waiting for the tram. There is something great about moving through the peak hour bustle, getting to work efficiently and doing something to reduce your carbon footprint. Long-term health benefits include increased strength, improved muscle tone, decreased body fat and reduced risk of cardiovascular disease, diabetes and some cancers. Remember, bike riding should not feel more strenuous than walking unless you want it to. Don’t push yourself too hard at first. Ride 2 Work cyclists are not only saving huge slabs of time, getting much fitter but have thousands of dollars to spare (reported from $6,000 – $15,000) from savings they are enjoying on fuel, car repairs, public transport tickets and parking. The blogs below explain how to get started and safely make a ’transport’ sea change to your life. There’s heaps more in the Guide including Ride2Work maps, gear selection, cafes enroute and street smart tips.